Jamie Baxter feels like an imposter at Fullbrook, but the hockey scholarship that got him in has given him a chance to escape his past and fulfill the dreams of his parents and coaches, whose mantra rings in his ears: Don’t disappoint us. 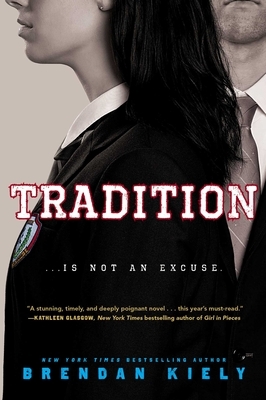 As Jules and Jamie’s lives intertwine, and the pressures to play by the rules and to keep the school’s toxic secrets, they are faced with a powerful choice: remain silent while others get hurt, or stand together against the ugly, sexist traditions of an institution that believes it can do no wrong. "Tradition isn't so much a book as it is an invitation and a promise. An invitation to stand up for ourselves and for what's right, and a promise that if we stand, we won't do so alone. Beautifully written with Brendan's wit and compassion, this book is a must read for all those hopeful for a better world." --Shaun David Hutchinson, author of the Florida Book Awards' Gold Medal and ALA's 2015 Rainbow Book List novel, The Five Stages of Andrew Brawley. * "A story that belongs in every library." “This novel is a timely road map for those looking to find their places in this rapidly changing world… A thoughtfully crafted argument for feminism and allyship."